Key Difference: A distinctive difference between the crab and lobsters is the shape of exoskeleton; the crab has a smaller circular exoskeleton, whereas the lobster is larger and longer. A lobster also has a long tail which consists of most of its meat. As compared to lobsters, crabs also have a distinctive walk; they tend to walk sideways, whereas lobsters don’t. When it comes to seafood, there is a lot of variety, from regular fish, to shellfish, such as shrimp, to mollusks and oysters. However, if someone where to be asked what they would like to have as a seafood treat, most will choose either crab or lobster. Crab and Lobster are two types of crustaceans. Crustaceans are a very large group of arthropods, which means that they have an exoskeleton, which they molt to grow. Unlike other arthropods, crustaceans have biramous (two-parted) limbs. Crabs are generally covered with a thick exoskeleton and have a single pair of claws. Crabs are found all over the world, and hence are a prime form of seafood in most cultures. They live in fresh water and on land, particularly in tropical regions. Crabs form about 93 families under the Brachyura, consisting of about 6,793 different species. Crabs can vary in size from the pea crab, which is a few millimetres wide, to the Japanese spider crab, which had a leg span of up to 4 metres (13 ft). However, many other animals with similar names, such as hermit crabs, king crabs, porcelain crabs, horseshoe crabs, and crab lice are not true crabs. Lobsters, on the other hand are invertebrates with a hard protective exoskeleton. Similar to crabs and other arthropods, lobsters must molt their exoskeleton in order to grow. When they molt their exoskeleton, they are very vulnerable. Lobsters have 10 walking legs. The front three pairs have claws, the first of which is the largest. These are what gives the lobsters their distinctive look. Lobsters also have antennas on the top of their head, which they use as sensors in the water and to communicate. It has been estimated that lobsters live up to 70 years old. In fact, research suggests that lobsters may not slow down, weaken, or lose fertility with age, and instead older lobsters may be more fertile than younger lobsters. There are many crustaceans that have the word "lobster" in their names, however, only the clawed lobsters of the family Nephropidae are considered as true lobsters. The closest living relatives of clawed lobsters are the reef lobsters and the three families of freshwater crayfish. A distinctive difference between the crab and lobsters is the shape of exoskeleton; the crab has a smaller circular exoskeleton, whereas the lobster is larger and longer. A lobster also has a long tail which consists of most of its meat. As compared to lobsters, crabs also have a distinctive walk; they tend to walk sideways, whereas lobsters don’t. Lobsters also have larger claws as compared to crabs. Also, the meat of crabs is generally considered to be sweeter. However, the meat of soft-shell lobsters is also very sweet. Although, the meat on the lobsters is more abundant, due to majority of it being located in the tail and due to its size, which is why lobsters are easier to eat. Lobsters are also generally more expensive than crabs, as they are not available as readily as crabs. The earliest unambiguous crab fossils date from the Jurassic (201 million years ago to 145 million years ago). The fossil record of clawed lobsters extends back at least to the Valanginian Age of the Cretaceous (140 million years ago). Covered with a thick exoskeleton, composed primarily of calcium carbonate. Armed with a single pair of claws. Lobsters have long bodies with muscular tails, and live in crevices or burrows on the sea floor. Three of their five pairs of legs have claws, including the first pair, which are usually much larger than the others. The lobster's head bears antennae, which are used as sensors. Lobsters, like snails and spiders, have blue blood due to the presence of haemocyanin which contains copper. Crabs are found in all of the world's oceans, while many crabs live in fresh water and on land, particularly in tropical regions. Lobsters are found in all oceans and found on land. They live on rocky, sandy, or muddy bottoms from the shoreline to beyond the edge of the continental shelf. They generally live singly in crevices or in burrows under rocks. Crabs vary in size from the pea crab, a few millimetres wide, to the Japanese spider crab, with a leg span of up to 4 metres (13 ft). It has been estimated that lobsters live up to 70 years old. Lobster longevity allows them to reach impressive sizes. According to Guinness World Records, the largest lobster ever caught was in Nova Scotia, Canada, weighing 20.15 kilograms (44.4 lb). In general, lobsters are 25–50 cm (10–20 in) long. Males often have larger claws. 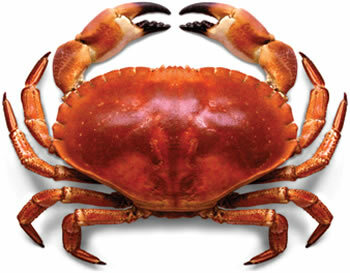 In most male crabs, the abdomen is narrow and triangular in form, while females have a broader, rounded abdomen. Males are often larger in size than females. Males also have a longer and wider shell than the females. Females have small sternal spines and long second pleopod as compared to male. Females also have wider tails than males because that is where she carries her eggs. Males have hard pleopeds, while females have soft, feathery pleopods. The female releases pheromones (chemicals) into the water to let nearby males know she is preparing to molt and mate. If there are multiple males interested in the female, they will fight each other for her. The lobster that wins the fight will take the female into his cave and protect her from predators since she is vulnerable while molting. Once she has shed her hard exoskeleton, the male gently turns her over and pierces her abdomen with his first pair of pleodods. He deposits sperm packets into her sperm receptacles; these she will store for up to 15 months before she releases eggs. When the female judges the time is right, she releases the eggs which pass by the seminal receptacle and are fertilized with the stored sperm. She will carry these eggs under her tail for the next ten to eleven months. When the eggs hatch, the baby lobsters don’t look like their parents. Crabs typically walk sideways. This is because of the articulation of the legs which makes a sidelong gait more efficient. However, some crabs walk forwards or backwards. Crabs are mostly active animals with complex behaviour patterns. They can communicate by drumming or waving their pincers. Crabs tend to be aggressive towards one another and males often fight to gain access to females. Crabs may also fight over hiding holes. Crabs are known to work together to provide food and protection for their family, and during mating season to find a comfortable spot for the female to release her eggs. Lobsters move by slowly walking on the sea floor. However, when they flee, they swim backward quickly by curling and uncurling their abdomen. A speed of 5 m/s (11 mph) has been recorded. This is known as the caridoid escape reaction. They are known to resort to cannibalism in captivity. However, when lobster skin is found in lobster stomachs, this is not necessarily evidence of cannibalism - lobsters eat their shed skin after moulting. Lobsters are omnivores and typically eat live prey such as fish, mollusks, other crustaceans, worms, and some plant life. They scavenge if necessary, and are known to resort to cannibalism in captivity. Crabs make up 20% of all marine crustaceans caught, farmed, and consumed worldwide, amounting to 1½ million tonnes annually. The biggest importers, and therefore countries where eating crab is immensely popular, are Japan, France, Spain, Hong Kong, the US, Canada and Portugal Crabs are prepared and eaten as a dish in several different ways all over the world. Some species are eaten whole, including the shell, such as soft-shell crab; with other species just the claws and/or legs are eaten. The latter is particularly common for larger crabs. Mostly in East Asian cultures, the roe of the female crab is also eaten, which usually appears orange or yellow in colour in fertile crabs. Highly prized as seafood, lobsters are economically important, and are often one of the most profitable commodities in coastal areas they populate. Cooks boil or steam live lobsters. The lobster cooks for seven minutes for the first pound and three minutes for each additional pound. Lobster recipes include Lobster Newberg and Lobster Thermidor. 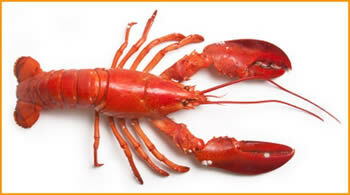 Lobster is used in soup, bisque, lobster rolls, and cappon magro. Lobster meat may be dipped in clarified butter, resulting in a sweetened flavour. In North America, the American lobster did not achieve popularity until the mid-19th century, when New Yorkers and Bostonians developed a taste for it. Prior to this time, lobster was considered a mark of poverty or as a food for indentured servants or lower members of society. Both the constellation Cancer and the astrological sign Cancer are named after the crab, and depicted as a crab. Highly prized as seafood, lobsters are economically important, and are often one of the most profitable commodities in coastal areas they populate.